After the success of TravelHack and TravelHack2 - we are very pleased to announce an amazing collaboration with the Department for Transport. 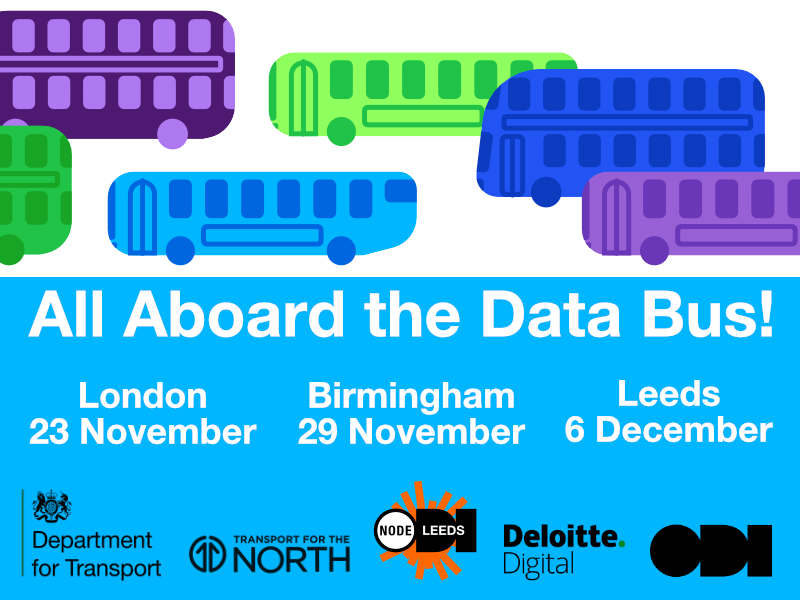 Beginning in November, we will be hosting three workshops around the country, giving local authorities, bus operators, transport data providers, and others the chance to discuss the open data provision in the Bus Services Act 2017. DfT are committed to building a robust open data policy/platform that will ultimately deliver the best outcomes for passengers, so they are keen to hear about how bus open data could work in practice. TravelHack2 revealed the current level of engagement and awareness among bus operators for open data - many still don't know what it is, how it differs from other data, and how they can best use it. These workshops present a chance to understand and influence how it will be integrated into the way DfT regulates the industry, raise the profile of bus open data (we already know it's awesome!) and get more bus operators, of all sizes, to publish data more openly. If you need to see the potential for open data and buses, just take a quick look at the outcomes from TravelHack2. Register here for the London event on 23 November. Register here for the Birmingham event on 29 November. Register here for the Leeds event on 6 December. Arrive. Meet, greet, and coffee. Grab a coffee/tea and have a chat. Complete online DfT survey if you have a chance. Wrap up and discussion, final thoughts from the day, and discussion about what needs to happen next. These events have been incredibly popular and filled up within the first week. If you've msised out on a ticket for any of the workshops, don't fret - you can still take part! Just add your thoughts, comments, questions, etc, to any of the open collaborative docs above and they will be seen by facilitators and attendees. Complete this short survey to help inform DfT about open data engagement. Available until 15 December, this one survey covers all three workshops and is also available to anyone who couldn't attend a workshop but might still have valuable input. Have your say about open data, digital inclusion, data formats, and more. For further details about the above themes, check out this document.